SRINAGAR: There are fears of a demographic change in the Muslim-majority state if Article 35-A is repealed or amended. Tension is growing in Indian-administered Kashmir amid fears India’s top court will revoke a law on Monday protecting exclusive citizenship rights. Article 35-A empowers the Jammu and Kashmir state’s legislature to define “permanent residents” and provide them with special rights and privileges. It also bars non-state subjects from purchasing property and having government jobs in the disputed state. In the event India’s supreme court repeals the law, there are concerns about a demographic change in the Muslim-majority state. 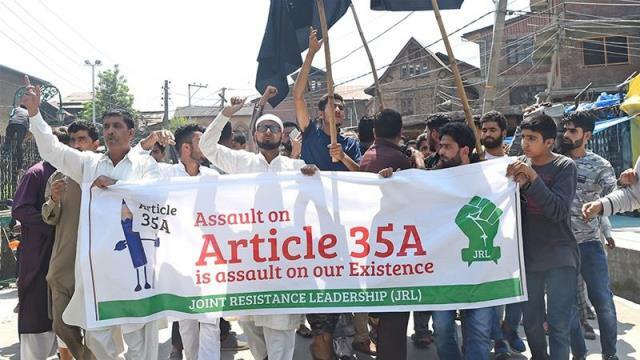 The group argues that Article 35-A is “highly discriminatory” and therefore, liable to be declared as unconstitutional. The article is, it says, against the “very spirit of oneness of India” as it creates “a special class of citizen within a class of Indian citizens”. 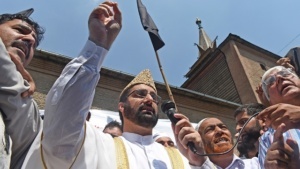 Kashmiri separatists, who support merging the region with Pakistan or an independent state, called for a two-day strike from August 5 against what they called a “serious challenge”, warning of “mass agitation” if the law is changed. Joint Resistance Leadership, an alliance of three separatist leaders – Syed Ali Geelani, Mirwaiz Umar Farooq and Mohammd Yasin Malik – said in a statement: “We want to make it clear to the government of India that Kashmiris will not take this attack on them lying low. Any and every attempt made at changing the demographic nature of the state will be stiffly resisted. “The existence of this law is important for the disputed region to keep its political issue alive,” the lawyer told Al Jazeera. “This law is the identity of Kashmir and this constitutional provision protects four things: state subject, right to property in the state, employment and scholarships. If any change is made to the law, people will lose these rights. India’s ruling right-wing Bhartiya Janta Party (BJP) dismissed people’s fears. “Those who are crying over it are fooling people. No one will lose jobs here. The matter is in court and whatever is decided, we will stand by that,” Ashok Koul, general secretary of BJP in the region, told Al Jazeera. “We oppose its repeal. This is about the rights of the citizens of Kashmir,” he said. “If the law is removed or tinkered with, then the rights of original citizens of Jammu and Kashmir on their immovable property and other such rights would be taken away, and all Indians would be afforded a right to establish their settlements in the length and breadth of the state, pushing away the original citizens,” they said in a statement to reporters.